Star Wars. Dir. George Lucas. Perf. Mark Hamill, Harrison Ford, Carrie Fisher, and James Earl Jones. Allusions in film are tricky. Is one film alluding to another? It is paying it homage? It is plagiarism? Or is it all in the mind of the viewer? 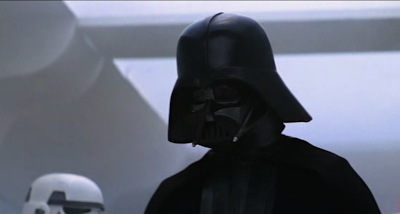 When I asked my students whether they got a sense of Darth Vader's entrance (without showing the two clips side-by-side), they thought it extremely likely. But I don't yet know whether the allusion is more purposeful than giving us a powerful entrance—one which, in Henry V's case, is undermined somewhat by his extreme youth and small stature. Shakespeare's Henry has a dark side that Branagh's usually lacks. Is the visual allusion to Darth Vader an attempt to present this aspect subtly? Or is it just kind of neat? Links: Star Wars at IMDB. Henry V at IMDB.